I have had an epiphany. An epiphany for me, mind you, not the world at large, because I am betting every single parent of a school-aged child already knows it. Kindergarten success has nothing to do with your kid and everything to do with how organized you, the parent, are. Case in point: we did not get home from Costco until 6:30 pm tonight (in my defense, it is 45-60 minutes away, traffic depending, and we picked up dinner), and Alex’s homework was still not done. Why? Because I had encouraged her to spread it throughout the week, leading to the fact that she still had homework to do on the day that we were gone, literally, from 8:40 am until 6:30 pm. Yay, Mommy! But I really needed to get to Costco. Anyway, I knew 5 days a week kindergarten was going to be an adjustment, especially living in a somewhat out of the way rural town like I do (because errands take a long time), and yes it really has been. Poor Sammy has been rather neglected as our lives have slowly been surely been taken over by Alex’s life at the elementary school. I seem to be perennially behind in everything, including planning Sammy’s birthday party and blogging. So please bear with me as my posts are a little more infrequent; I remain as dedicated as ever to this little enterprise. These marshmallows, adapted from a recipe in Eileen Talanian’s Marshmallows: Homemade Gourmet Treats , are just about the easiest I have ever made. They come out of the pan and slice up like a dream. 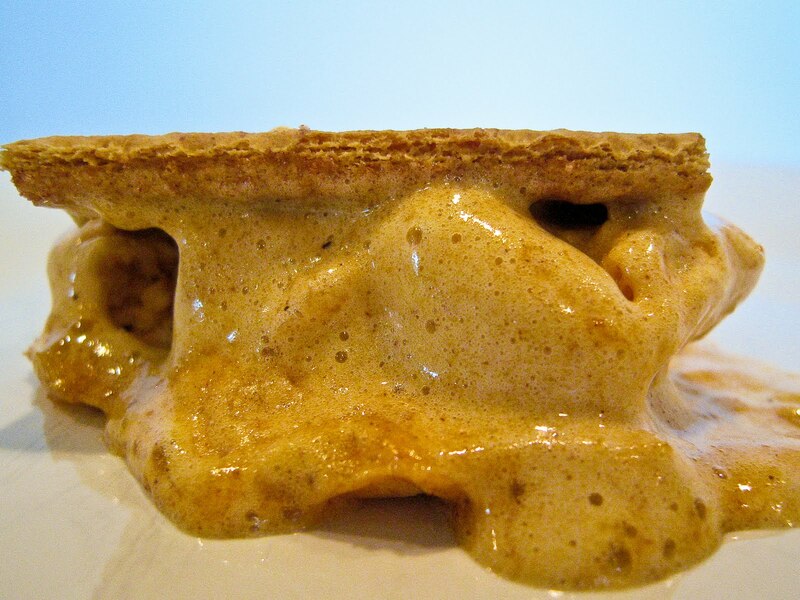 They taste like pumpkin pie in a marshmallow, and they make an amazing autumnal s’more with nothing else but cinnamon graham crackers–no chocolate needed. The amount of spices you should use is pretty individual; I will provide a range. This picture was taken about a week after I made the marshmallows, which is why the tops are a little dried out and cracked. But they still tasted plenty yummy. One note about the gelatin: when I was typing this recipe out, I realized that I made it (twice no less) with less gelatin than she calls for. The recipe still came out, both times. I made it with 3 tablespoons of gelatin and she calls for 4 tablespoons. Make of this what you will. Lightly spray the bottom and sides of a 9X13X2 or 11X15X1 pan, and then wipe the pan out, leaving only a very thin film of oil. Using a sifter, layer the bottom of the pan with a fairly thick layer of marshmallow coating (you might consider adding 1½ t ginger, 1 t cinnamon and ¾ t cloves to the basic coating recipe for a gingerbread spiced coating; I did so for one of my batches). Let it hit the sides and corners of the pan as much as possible. Set aside. Measure your ½ cup water and whisk it with the pumpkin puree. Dump the gelatin into a medium sized bowl and set the pumpkin puree mix beside it. 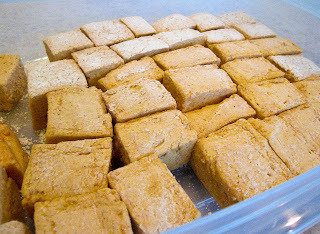 Place the remaining ½ cup water, marshmallow syrup, salt and sugar into a heavy 4 qt pan--in that order. Stir twice. Bring to a boil over medium high heat; while waiting, whisk together the pumpkin puree mix with the gelatin and dump it into the bowl of your stand mixer. Set the mixer bowl in the mixer and attach the whip. When the syrup boils, place a lid over it for 2 minutes to prevent crystals. Then remove the lid and increase the heat to high. Attach a candy thermometer to the side of the pan. Heat the boiling sugar mixture to 255 F; do not stir. When it reaches 255 F, remove the thermometer and turn off the heat. Moving quickly but very carefully, pour the syrup into the mixer bowl with the mixer running on low speed. Slowly increase the speed to high and place a towel over the mixer to prevent being hit by splattering liquid. Whip on high for 10 minutes. Slow the mixer down to a medium low speed and add the spices. Increase the speed back up to high and whip one more minute. After adding the spices and mixing the additional minute, lower your bowl (I like to do this with the mixer running as it helps remove some of the fluff from the whip attachment). Have a large spatula ready. Turn off the mixer--working quickly now--and remove the whip attachment, knocking as much fluff as possible back into the bowl (do not get too hung up on this, you are going to lose some fluff no matter what). Using the spatula, scrape the fluff into the prepared pan and smooth it as evenly as possible. Set aside, uncovered, to set for 4-6 hours. When the marshmallows have set, use a table knife to gently loosen the marshmallow cake from the sides of the pan. 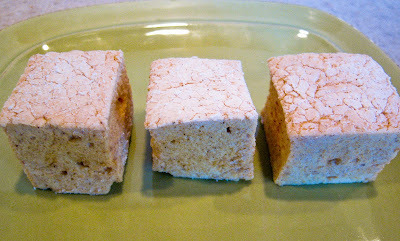 Sprinkle your marshmallow coating over a cutting board--I like a large wooden one. Using your fingers (you're going to get messy, just have clean hands and accept it) or a flexible turner, loosen the marshmallow cake from the bottom of the pan. Once you are certain it is loose, use both hands to gently remove the cake and place it on the prepared cutting board. (This step was so easy with this recipe.) 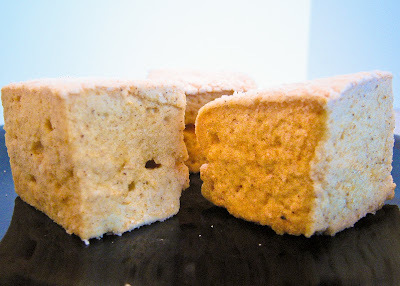 Using a chef's knife, slice the marshmallows into squares. You may need to occasionally clean your knife or dredge it in the coating powder. Roll each marshmallow in the coating powder before storing, in a single layer, for up to a week. I plan to acquire a 11 X 15 baking pan so I can make thinner marshmallows--and then I would like to slice this recipe in the shape of pumpkins and other Halloween appropriate shapes with cookie cutters. I have not tried it yet--it needs the larger pan so the marshmallow cake is thinner, more like the thickness of the cookie cutter, which should not be thinner than the marshmallow cake--but if you try it let me know how it turns out! Affiliate links were used in this post to link to items I was discussing. It's kind of insane to me that kindergarteners have homework! I didn't have homework until middle school! Totally not looking forward to my oldest starting school next year. The marshmallows look fantastic. 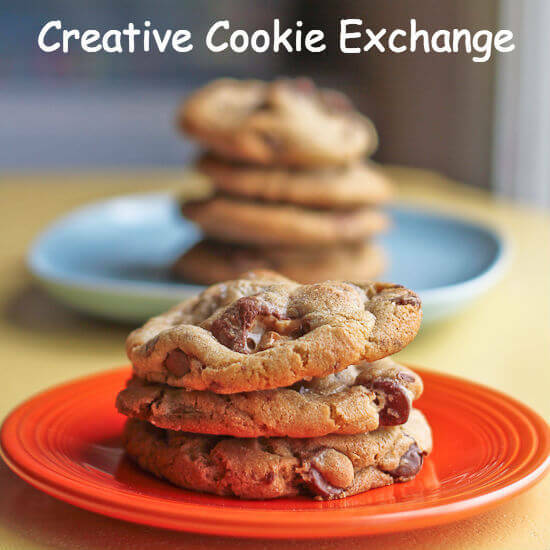 I think I'm going to make them this afternoon. Oy keeping school under control sounds much harder on the parent than I ever thought it was! I'm sure you guys will get into a groove though. It IS only the beginning, after all. Um these marshmallows sound amazing. I love everything pumpkin pie related. You're a juggler…these marshmallows are clear evidence that you keep everything organized AND fun. I have never made marshmallows before but these look wonderful, especially with the pumpkin flavor! Oh wow! These marshmallows look amazing!!! I have never made my own marshmallows – although they are on my to-do list. I might have to skip right to these awesome fall ones. I am loving the idea of an autumn smore. The name was enough. We are all huge marshmallow fans. And to have a photo of a golden, sticky, gooey one melting all over a graham cracker. Perfect! i've never made marshmallows before. these look so tasty, and pumpkin pie flavor is just delightful!